Artist’s illustration of the Kuiper Belt object 2014 MU69, the next flyby target for NASA’s New Horizons mission. This binary concept is based on telescope observations made from Argentina on July 17, 2017 when MU69 passed in front of a star. New Horizons scientists theorize that MU69 could be a single body with a large chunk taken out of it, or two bodies that are close together or even touching. NASA's New Horizons spacecraft may double its pleasure during its next deep-space flyby 16 months from now. Mission team members decamped to various spots around the globe to watch three occultations this year, one each on June 2, July 10 and July 17. Observations of the most recent one, which scientists made from southern Argentina, suggest that 2014 MU69 may actually be two separate bodies, New Horizons team members said. Artist’s illustration showing 2014 MU69 as a long and relatively skinny object. MU69 could also be a body with a large chunk out of it, or two separate objects that orbit closely to each other (and perhaps even touch). These two objects may be orbiting each other closely, or they could be touching, the team members added. "This new finding is simply spectacular. 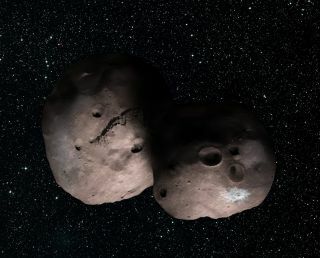 The shape of MU69 is truly provocative, and could mean another first for New Horizons going to a binary object in the Kuiper Belt," mission principal investigator Alan Stern, from the Southwest Research Institute in Boulder, Colorado, said in a statement. "I could not be happier with the occultation results, which promise a scientific bonanza for the flyby." It's also possible that 2014 MU69 is a single object — one that's relatively long and skinny, or a more spherical one with a big chunk taken out of it, NASA officials said. Further analysis of the occultation data may allow New Horizons team members to get to the bottom of the mystery, the officials added. Thanks to the occultation observations, MU69's size is now better understood as well. If the flyby target is a single body, it's no more than 19 miles (30 km) long. If it's a binary, each of the two pieces is 9 miles to 12 miles (15 to 20 km) long, mission scientists said. The occultation campaign was an extensive effort that involved a number of assets and instruments. For example, NASA's Stratospheric Observatory for Infrared Astronomy (SOFIA) — a 747 jet equipped with a 100-inch (2.5 meters) telescope — observed the July 10 event. And mission team members used observations by NASA's Hubble Space Telescope and the European Space Agency's Gaia spacecraft to choose the best viewing spots on the ground. "Both of these space satellites were crucial to the success of the entire occultation campaign," Stern said.